T.John Institute of Technology, Bangalore has advertised in the DECCAN CHRONICLE newspaper for recruitment of Lecturers jobs vacancies. Interested and eligible job aspirants are requested to apply on or before 25th February 2019. Check out further more details below. 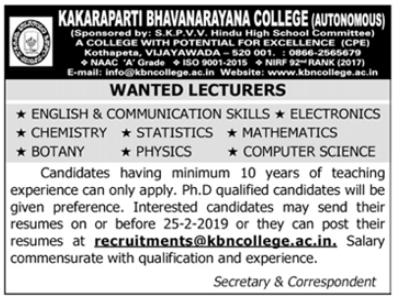 About College : Kakaraparti Bhavanarayana College (Autonomous) is an exuberant outcome of a century old illustrious charitable organization, Sri S.K.P.V.V. Hindu High Schools Society, which for the last 112 years, has been providing education through its eight reputable academic institutions. It is one of the pioneering educational institutions in Vijayawada run with the motto "TEJASWINAVADHITAMASTU" which means“May our Study be Enlightening”. The college is known for its perseverance to academic excellence and value-based holistic education. Comprehensive education attained by students of the college enables them to participate in developmental and transformative activities for the benefit of the community and the society at large. The College firmly believes in the maxim that service to Man is service to God, especially with regard to education, which is truly the pathway for enlightenment.